A perfect tragedy should, as we have seen, be arranged not on the simple but on the complex plan. It should, moreover, imitate actions which excite pity and fear, this being the distinctive mark of tragic imitation. It follows plainly, in the first place, that the change of fortune presented must not be the spectacle of a virtuous man brought from prosperity to adversity: for this moves neither pity nor fear; it merely shocks us. Nor, again, that of a bad man passing from adversity to prosperity: for nothing can be more alien to the spirit of Tragedy; it possesses no single tragic quality; it neither satisfies the moral sense nor calls forth pity or fear. Nor, again, should the downfall of the utter villain be exhibited. A plot of this kind would, doubtless, satisfy the moral sense, but it would inspire neither pity nor fear; for pity is aroused by unmerited misfortune, fear by the misfortune of a man like ourselves. Such an event, therefore, will be neither pitiful nor terrible. There remains, then, the character between these two extremes, — that of a man who is not eminently good and just, — yet whose misfortune is brought about not by vice or depravity, but by some error or frailty. He must be one who is highly renowned and prosperous, — a personage like Oedipus. I thought I’d bold the key passages to try to make Aristotle more accessible. Don’t even begin to ask what my nose was doing stuck in an Aristotle text. The point is, my nose was there. The above paragraph immediately started me thinking about our current crop of superhero movies. They would not bill themselves as tragedy, so it’s possible that none of these guidelines is useful. However, Aristotle is Mr. Drama. What he considered the best theater must still resonate, even when the theater becomes a movie and the tragedy becomes a comic book universe. Jump in and join in my game . . . I first thought of the new Superman, Man of Steel. Interestingly, Clark Kent falls into Aristotle’s last definition of the worthy hero, which is not always where a fan would place him. Flawed? Anathema! But the new Clark fits this category. When Clark’s dad, Jonathon, (SPOILERS, darling) runs back to save the family dog during the tornado, Clark struggles with indecision. Should he keep his identity secret and let his dad die, or reveal himself and save his dad? Aristotle would call this moment of indecision frailty and error, a step on the road to tragedy. This scene came to mind because I felt genuine pity as I watched. We would balk strenuously at an ending that put our superheroes in a genuine tragedy, but these small tragic moments in the middle are welcome and probably necessary. A man does not become a superhero on a whim; he must be driven to it. 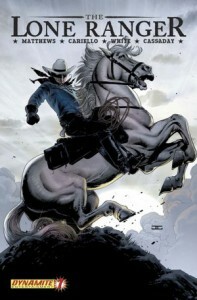 My second thought, horrifyingly, was of our most recent watch, The Lone Ranger. Yes, I’m afraid we must call this a superhero movie. Kemosabe fits quite well into Aristotle’s plan. He is not prosperous and he is not bad. He lands right in the middle, and he lays out plenty of errors and misjudgments. When the Ranger (SPOILERS, darling) captures Butch — knocking out Tonto in order to do so — and returns him for justice, he delivers the bad guy right into the hands of his brother, the surprise other bad guy. Guess what, though: I feel no pity. I think this Lone’s a whiny idiot. I wonder if Aristotle didn’t cover this in the last sentence of the above quote. The Ranger of this story has no renown. He’s a doofus from the get-go. Without a level of respect for our hero, we can’t have our sympathies played upon. Aristotle helps us find the foundational flaw with this movie: a worm cannot have a worthy character arc. No post on superheroes would be complete without the Batman. Immediately I think of the origin story in Batman Begins. Bruce Wayne is as prosperous as can be, yet he displays a lack of virtue when he takes a gun to court to shoot the dude who killed his parents. Aristotle seems to be saying that if we are to pity a rich man, he must make a foolish choice. The death of his parents is only adversity; his story truly begins when Bruce reacts poorly. And there we have the start to, potentially, an ongoing reference point. Aristotle has more to say about Tragedy. Stay tuned . . .
Ooh, I like where this is going. But honestly, I did not hate The Lone Ranger (the character) as much as you did. I thought his goofiness was charming. The story still didn’t go the direction I wanted it to go, though.